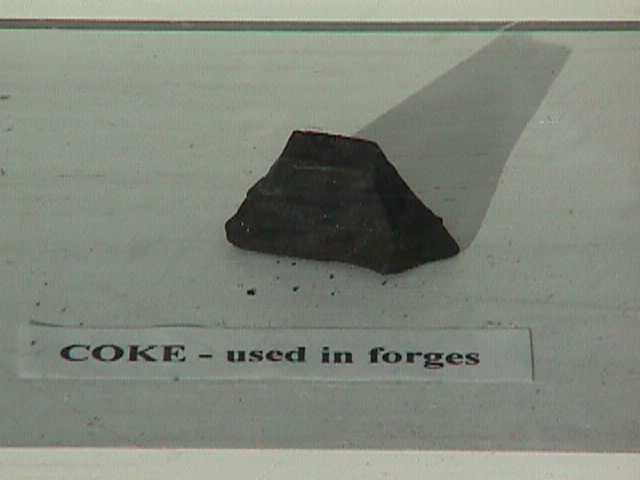 Iron ore was found by 1790 on Ore Hill in Lisbon (now Sugar Hill). 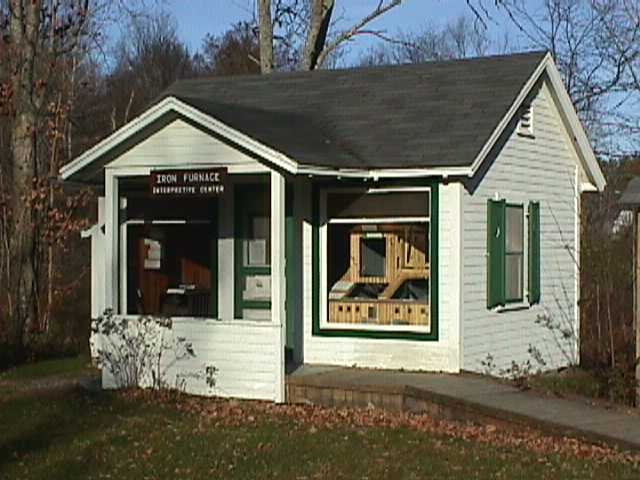 The Franconia Iron Furnace is New Hampshire's sole surviving example of a post Revolutionary furnace for smelting local iron ore. The industry flourished during the first during the first half of the 19th century. It produced pig and bar iron for farm tools and cast iron ware, including the famous &quotFranconia Stoves". The New Hampshire Iron Factory was incorporated in 1805 by businessmen from Salem, Massachusettes, who had made money in the China trade. The iron furnace was built on the site of a forge and dam erected in 1801 or 1802 by three local men -- Simon Oakes, Thomas Spooner, and David Applebee. The furnace is unusual in its octagonal shape and its remarkable condition. 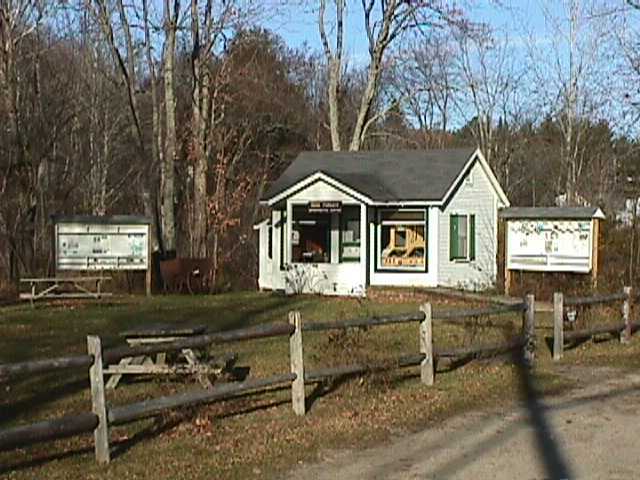 White Wings Bed & Breakfast - Sugar Hill, NH - Near the Iron Furnace! 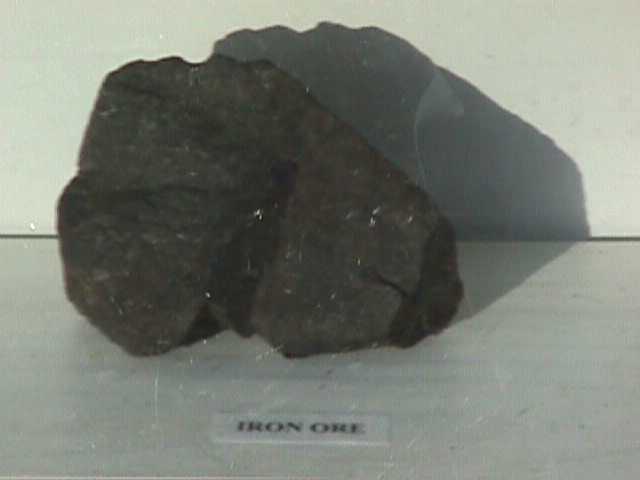 Iron ore was found by 1790 on Ore Hill in Lisbon (now Sugar Hill). 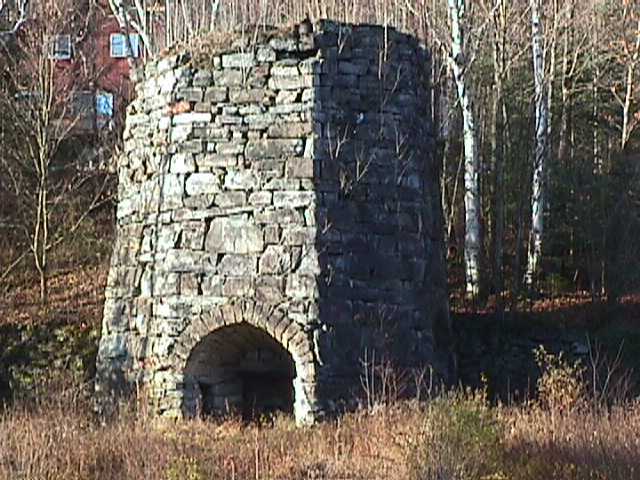 The Franconia Iron Furnace is New Hampshire's sole surviving example of a post Revolutionary furnace for smelting local iron ore. The industry flourished during the first during the first half of the 19th century. It produced pig and bar iron for farm tools and cast iron ware, including the famous &quotFranconia Stoves". The New Hampshire Iron Factory was incorporated in 1805 by businessmen from Salem, Massachusettes, who had made money in the China trade. 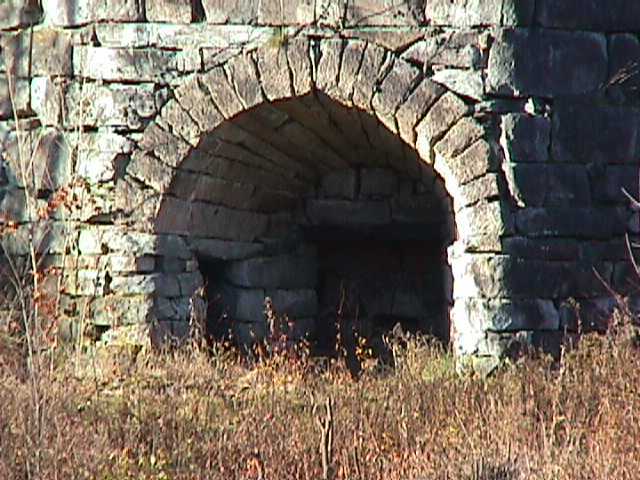 The iron furnace was built on the site of a forge and dam erected in 1801 or 1802 by three local men -- Simon Oakes, Thomas Spooner, and David Applebee. The furnace is unusual in its octagonal shape and its remarkable condition. A huge wooden shed protected the furnace and the workers from the weather. The shed filled the area between the river and the upper terrace in the rear. A strong man wheeled an ore cart over a covered bridge from the sheds to the top of the furnace. 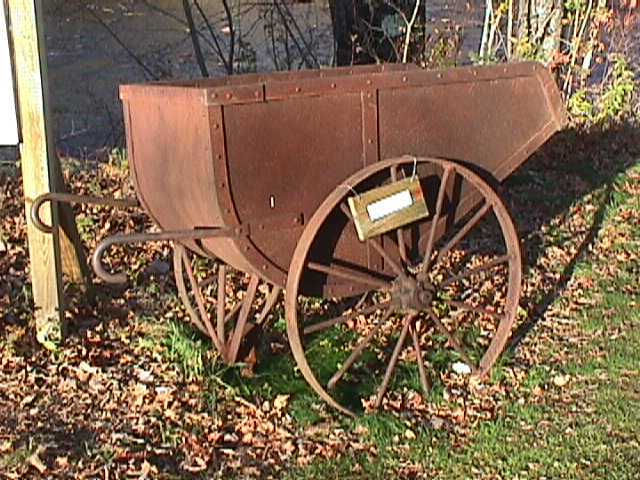 The rusted wheelbarrow was used to feed charcoal, iron ore and limestone into the furnace from above. .
Part of a model of the furnace building on display. .
Iron ore was hauled in two-wheeled oxcarts from mines three miles to the southwest. Once started, the fire was kept roaring for four to six months. Air pumped from water powered bellows fanned the coals. In later years, hot air was drawn off the top and piped down to the coals - the hot blast method. 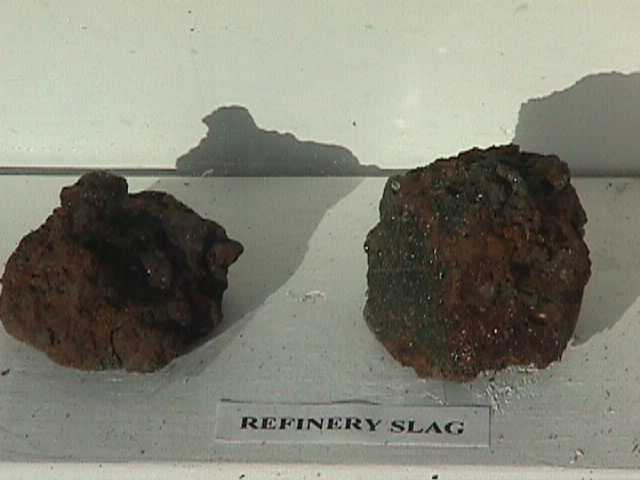 When the iron ore was melted, impurities floated to the top, This &quotslag" was drawn off the surface of the molten mass. Slag, released from the top of the molten mass, ran into a slag bowl and was dumped into the river. 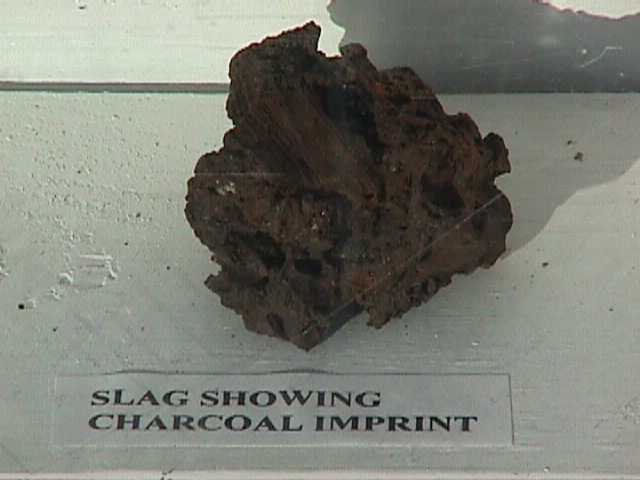 Slag raked off the molten iron. .
Every 24 hours a clay plug near the bottom was removed, allowing liquid iron to flow into sand furrows and form iron bars called &quotsows" and &quotpigs". Residents for miles could see the reflected glow from the hot iron. Some of the pig iron was remelted ar a refining forge and converted to wrought iron. 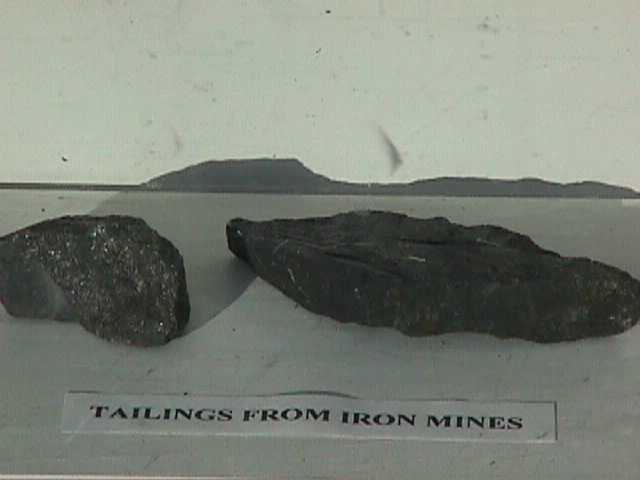 This malleable iron could be reheated and hammered into products by blacksmiths and foundrymen, or molded into iron bars. 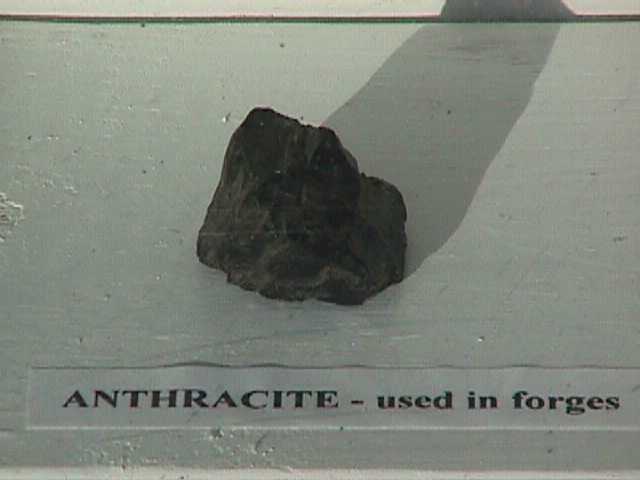 Other pig iron was cast directly at the furnace into kettles and heating stoves, which were sold in the company stores in Franconia and in Bath, New Hampshire. 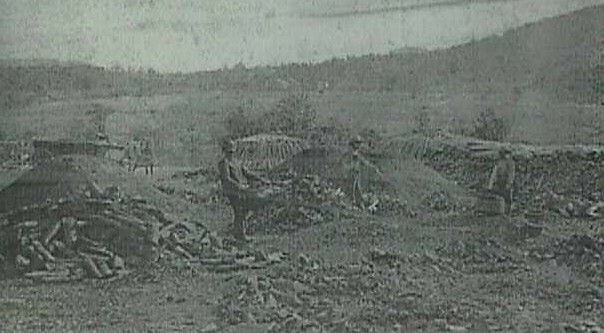 Iron pigs and products were shipped south on the Connecticut River from Bath. 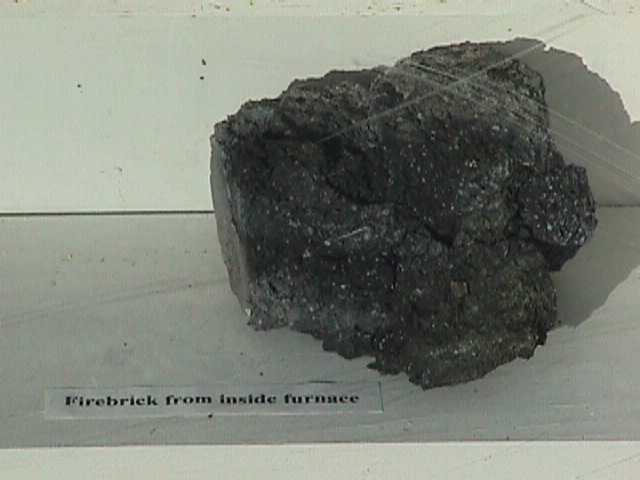 The furnace and its site are privately owned. Trespassing is dangerous and forbidden. There are free exhibits in the white building. Miners with pick axes chipped ore from the hill, for 50 cents a day. Oxen pulled loaded wagons three miles to storage sheds above the furnace. 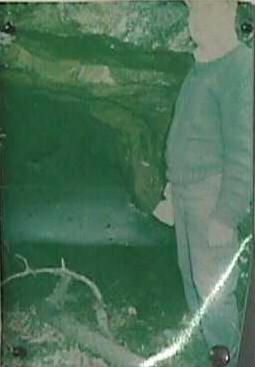 Trench left by removal of principal vein about 3 1/2 to 4 feet wide and 30 feet deep. .
Don Eastman at a mine cave. .
Nearly all of the trees in the area were cut down to make charcoal to fuel the furnace. 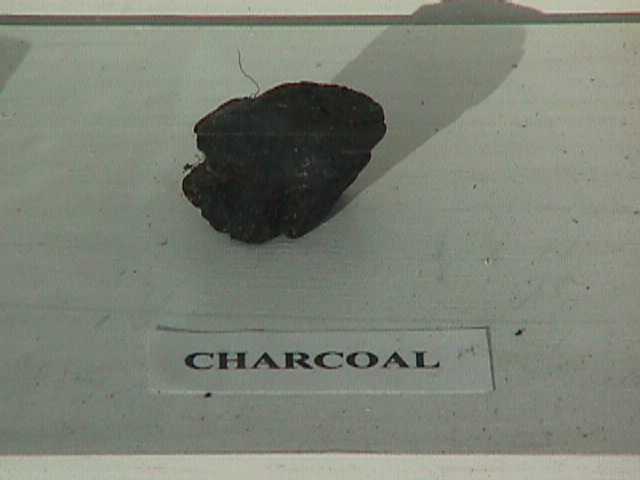 A man who made charcoal was called a collier. He cut down trees, sawed the wood into short lengths, split the logs and stacked them around a center opening -- all by hand, with a saw and an ax. 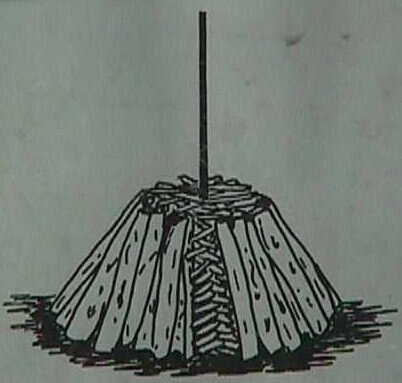 He placed layer upon layer of wood to form a mound, then covered the mound with leaves, branches and charcoal dust to make it airtight, before igniting through the center hole. The collier had to watch his charcoal heap closely -- day and night -- for two weeks, while it smouldered. He got little sleep. If the fire broke into flames, all of his work would be lost. Every day the collier had to climb up the mound and jump on it to see if the wood was burning too much. He carried a long pole crosswise, so that he could pull himself out if he fell into the burning mound. For full details, see "The Iron Industry in Franconia and Sugar Hill," by Roger W. Aldrich. 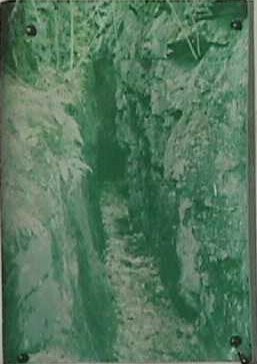 Sketches are by Nancy Aldrich.) . . .
5 boxes (56 pounds each) iron ore.
1 box limestone (for flux). 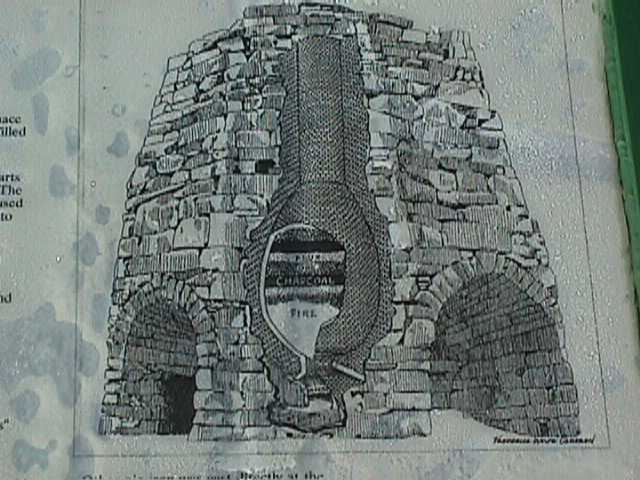 Hot Blast was introduced into the Franconia furnace in 1844. Air was piped to the top of the furnace, where it was heated by the hot gasses, then drawn down to be directed into the firebed. 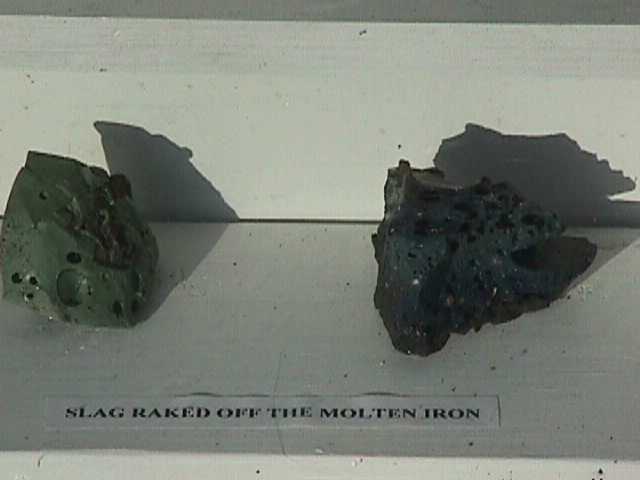 Molten ore was poured from a ladle into molds. 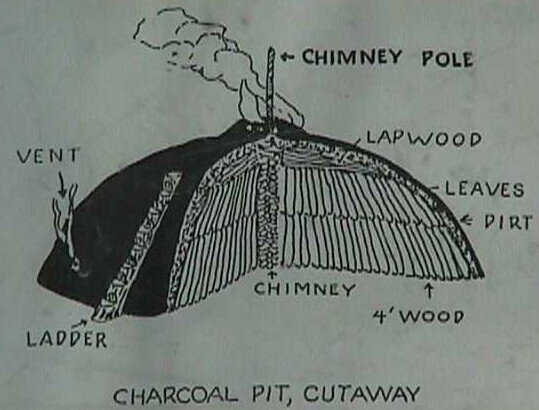 In 1838, the furnace produced 2 1/2 tons of pig iron a day. 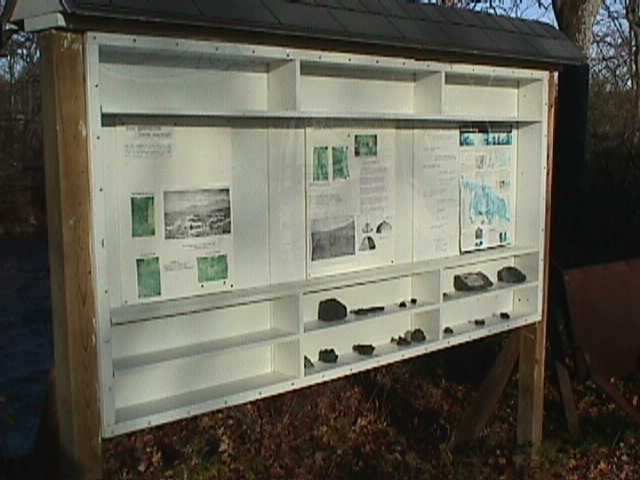 Stores in Franconia and Bath. 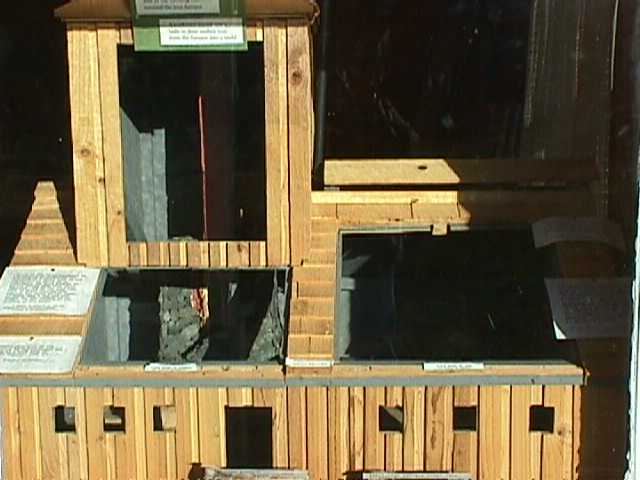 This is a similar process at the Saugus, MA iron works in the 1640s. 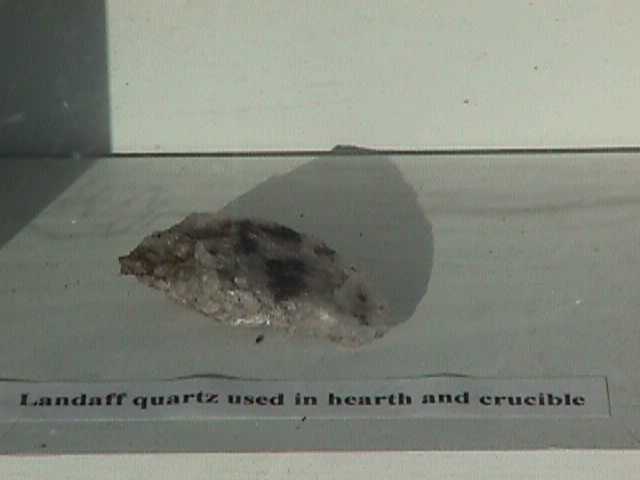 (National Park Service, US Department of the Interior). .
Slag showing charcoal imprint. .
Landaff quartz, used in hearth and crucible. .
Firebrick from inside furnace. .
Anthracite used in forges. . 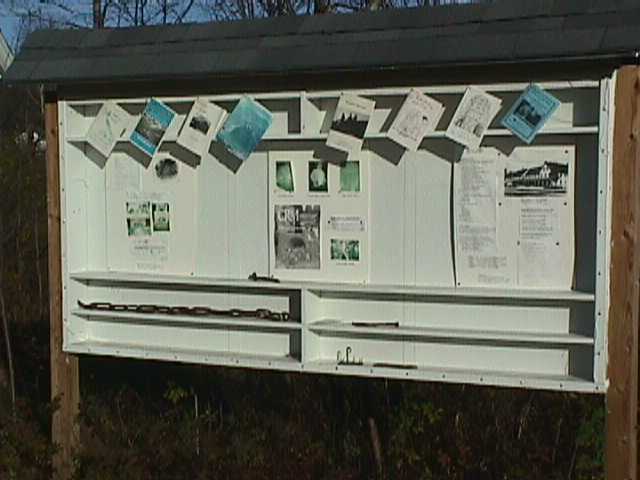 Example of chain and other things made from Franconia iron. .